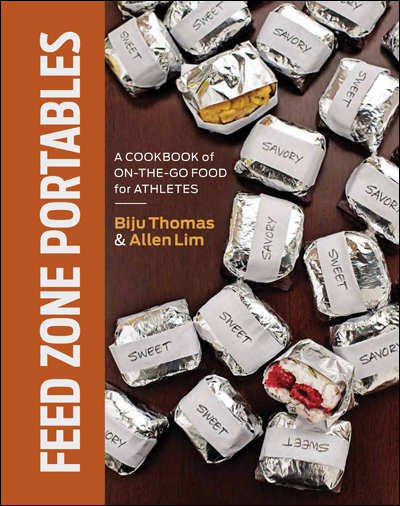 In their new cookbook Feed Zone Portables, Chef Biju and Dr. Lim offer 75 all-new portable food recipes for cyclists, runners, triathletes, mountain bikers, climbers, hikers, and backpackers. Each real food recipe is simple, delicious during exercise, easy to make—and ready to go on your next ride, run, climb, hike, road trip, or sporting event. With the recipes, ideas, and guidance in Feed Zone Portables, athletes will nourish better performance with real food and learn to prepare their own creations at home or on the go. Feed Zone Portables offers 75 all-new recipes that taste great during exercise. Find Feed Zone Portables in your local bookstore; bike, tri, or running shop; or online from the publisher VeloPress, Skratch Labs, Amazon, Barnes & Noble, Chapters/Indigo, TriSports.com, your local independent bookseller, or for Apple’s iPad.